I sit right next them. We don’t need to have a staff meeting. I used to have staff meetings, but we stopped having them. Nobody had anything to talk about. We have enough meetings. We certainly don’t need another. For a myriad of reasons, many operators and managers don’t hold regular staff meetings. Furthermore, most who do don’t get the most they could from them, and that’s too bad. Good staff meetings can focus a team, energize employees, and engage them in ways ad-hoc interactions don’t. So how do you turn a halted or ho-hum approach to staff meetings into a high-functioning management tool? Purpose is why you do what you do. You connect the work to it by explaining how what people did aligns with the greater goal. For example, the manager at a busy car wash might hold a meeting with the frontline staff. In that meeting, the manager might recognize a team that received a perfect score from all customers who took a survey and then talk about purpose. The obvious purpose of the car wash is to produce a clean, shiny, and dry car at the wash exit. But there is more to it than that. For customers to feel good about driving off in a clean car, their experience has to be a pleasant one. Having a clean, welcoming, and functioning facility is one of the ways the staff achieves that goal. organization’s leaders talk about the importance of their work. They also tend to make better choices if they receive frequent reminders about purpose and what types of activities support it. In many organizations, there is a huge appreciation shortage. Staff meetings provide managers and employees with regular intervals to practice gratitude. A steady drip of sincere gratitude can drive engagement. Note the word: sincerity. Most people have an amazing capacity to identify a false compliment. Real praise is specific. Well-delivered praise also ties the action to the outcome. Whether it’s being able to attend a conference, looking good in front of others, or some other result, people appreciate praise more when they understand how their actions delivered results. A praise segment in your staff meetings ensures you routinely take the time to recognize efforts. Staff meetings that include an opportunity to share lessons learned help drive continuous improvement. At first, people may be reluctant to share shortcomings. However, if you follow step four, you should begin to develop better communication and a sense of trust with your team. Modeling the process is a good place to start. 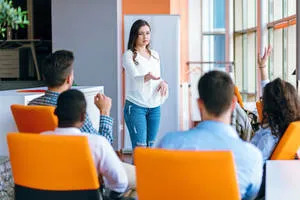 Almost anyone can follow the first five steps some of the time, but those who get the most out of staff meetings hold them consistently. They publish a meeting schedule, and they stick with it. They may shorten a meeting from time to time or reschedule, but they don’t treat their chance to gather the team as the least important priority. Good staff meetings aren’t perfunctory activities that add little value. On the contrary, when used to their full capacity, they are a dynamic management tool. Now, what are you going to do about yours?